Tired of public transport and endless walking? Want to spend less time commuting and more time with your family and friends? Dodge Ram Pickup – is the answer! This car will make your life much easier and more comfortable and you are sure to fall in love with it from the first sight. This sleek and compact model was manufactured in 2009 and has been in demand ever since. Following its release date Dodge Ram Pickup has acquired popularity and respect and has been sold in many countries of the world. You can purchase this car very simply by ordering it and it will be delivered to you as soon as possible. The exterior color of the Dodge Ram Pickup is Bright Silver Metallic, which is an eye-catching, vivid, but not too bright a shade. The vehicle of this color is sure to become a real envy to your colleagues, relatives, or anybody partial to this model. The Bright Silver Metallic will invigorate the outside of your car. This Dodge Ram Pickup Quad has been designed with elegant simplicity. The only word you may say after a glance at this car is “Wow!” You will be totally impressed and surprised owing to the thought-out design of this automobile and durability and efficiency it provides. 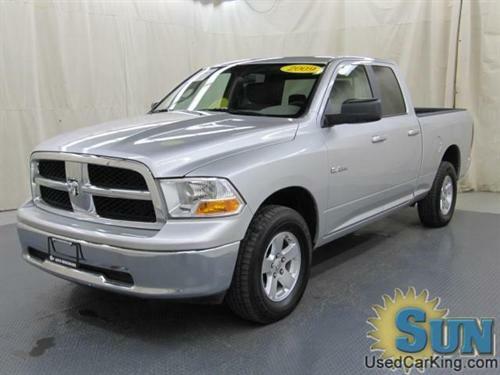 Dodge Ram Pickup Quad is exactly what you need! The 8-Cylinder, 4.7L of this automobile produces enough power for this vehicle to travel fast and accelerate quickly. This engine is really efficient and is a joy to the driver of Dodge Ram Pickup. From this time forward you will keep all your appointments and will take a real pleasure in driving this car. Depending on the engine your car is equipped with, you should always use suitable fuel. This car consumes Gasoline/E85. It should be noted that this type of fuel is quite economic and eco-friendly. No matter what you use, though, your car will run smoothly and you will enjoy your drives to the full. This Dodge Ram Pickup has so far covered 33153. Though, you can be absolutely sure that this car is in good enough condition to travel many more miles. The price we offer you will definitely make up for everything and will leave you in no doubt about purchasing this automobile. The Vehicle Identification Number also contains the very important set of information concerning the country of the car, its parental company, its drive train, type, gross weight, trim package, body style, engine power, year of construction, place of assembly, and, at last, the manufacturing number. The VIN of this model is 1D3HV18PX9S803709. Thus, Dodge Ram Pickup is a personification of its famous maker. It combines the highest achievements of engineering thought and technology and can easily be called a safe, comfortable and reliable vehicle that has everything you might need from a car. Make up your mind and choose this flagship model!